So I am ALL about the food during the Super Bowl. I have absolutely ZERO interest in football and I really don't care much about the commercials anymore either. But when it comes to getting together with friends and eating good food, I'm all for it. I pinned this recipe a while ago and it sounded like the perfect Super Bowl finger food. 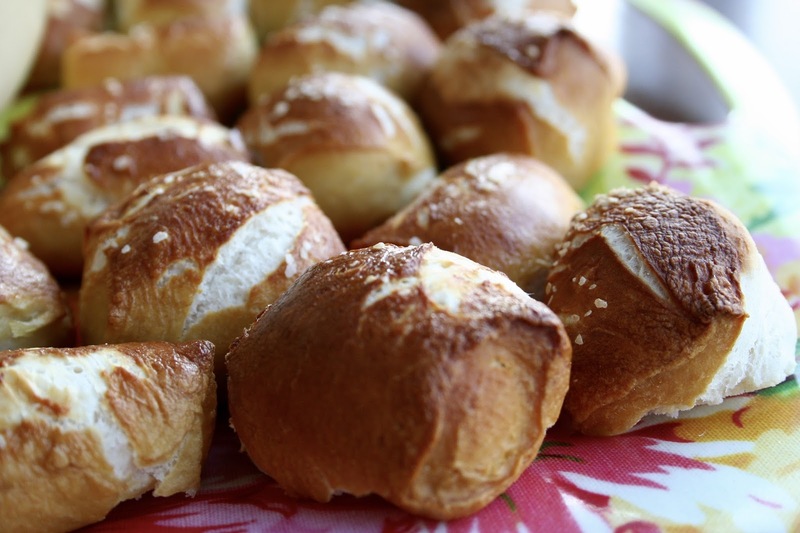 I am obsessed with homemade pretzels, as you can see here, here and here, so I knew I would love them. They take a second to make and if you're pressed for time, I would suggest having someone help you roll the dough into ropes, but other than that it's a pretty easy recipe. I really had fun making these and would definitely love to make them again. 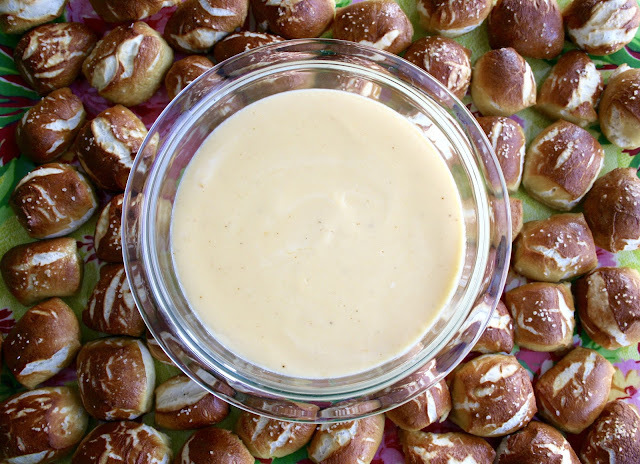 The cheese sauce was perfect, too, because you HAVE to have something to dip pretzel bites in, right?? 1. Dissolve yeast in warm water in a large mixing bowl. Stir with a spoon until fairly mixed, about 1 minute. Some clusters of yeast may remain. Add salt, sugar, and melted butter; stir until fairly combined. 2. Slowly add 3 cups of flour, 1 cup at a time. Mix with a wooden spoon (or dough hook attached to stand mixer) until dough is thick. Add 3/4 cup more flour until the dough is no longer sticky. If it is still sticky, add up to 1/4 cup more. Poke the dough with your finger - if it bounces back, it is ready to knead. 3. Turn the dough out onto a lightly floured surface. Knead the dough for about 3 minutes and shape into a ball. Place in a large mixing bowl that has been lightly coated with nonstick spray. Cover and let the dough rest in a warm area for about 10 minutes. 4. Preheat oven to 425°F. Grease or line two large baking sheets with silicone baking mats. (DO NOT use parchment paper, the pretzels will stick to it.) Set aside. 5. With a sharp knife, cut ball of dough into 6 sections. Roll the dough into six 20-inch long ropes. Cut the rope into 1.5 inch pieces to make bites. 6. 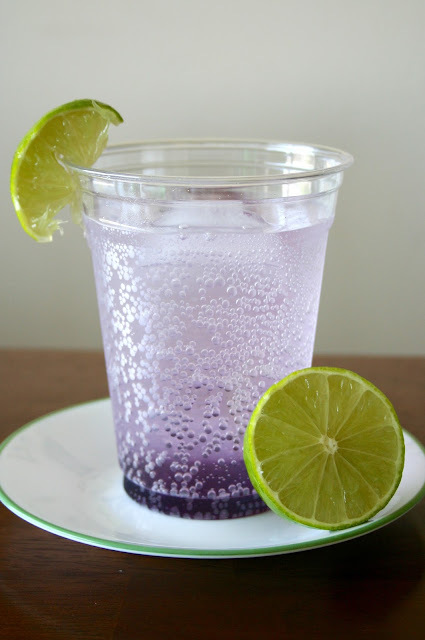 Boil 9 cups of water with the baking soda. Make sure it is rapidly boiling. Drop 8-10 pretzel bites into water and let sit for 20 seconds. Remove with a spatula and place onto the prepared baking sheet. Make sure the bites aren't touching. 7. Brush beaten egg over each pretzel bite. Sprinkle with kosher salt. Bake batches for 15 minutes each, or until golden brown. 8. Remove from oven and serve with cheese sauce. 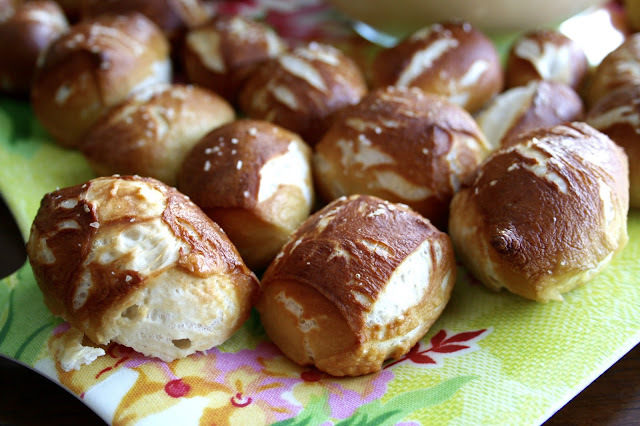 Pretzel bites remain fresh for up to 3 days in an airtight container, though they will lose some softness. 1. 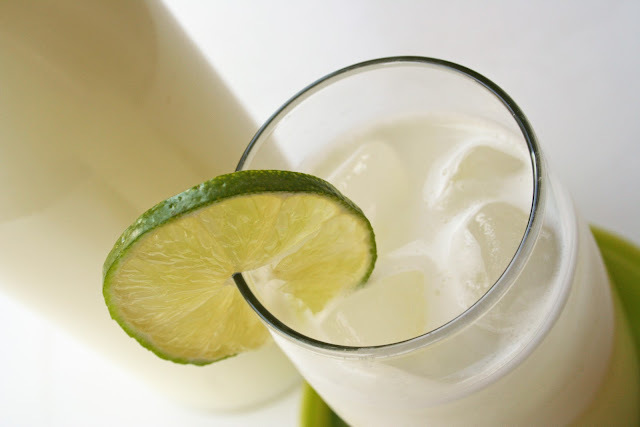 Heat the milk in a large saucepan over medium heat until you see bubbles forming on the top. 2. Meanwhile, melt the butter in another saucepan over medium heat. Sprinkle the flour over the top, stirring constantly until a thick paste forms, 1 to 2 minutes. 3. Slowly add the warm milk to the flour and butter paste in a steady stream, whisking constantly. Continue cooking, whisking constantly until the mixture thickens, about 5 minutes. It should be thick but still pourable. 4. Add the cheese, whisking constantly until it is melted. Add the cayenne. Add salt and pepper to taste. Add more cayenne, if preferred. 5. The sauce will thicken upon cooling. Store leftovers covered tightly in the refrigerator. Heat over stovetop or in the microwave before serving again.